New Parliament is in place. The old MPs are gone. One of them was HHK MP Aram Harutyunyan, who was charged few months ago with a massive 4.2bln bribery case for his alleged actions while serving as Minister of Nature Protection. The bribe issuer businesswoman came forward with the details. NSS had to contact United Arab Emirates to get the suspect's banking details. Because he no longer has MP's immunity, the police has issued an arrest warrant for him. His whereabouts are unknown. Harutyunyan is also accused of abusing his power to issue illegal mining licenses, bribery, money laundering. NSS investigation found that a police officer, director of Hayantar government-run organization tasked with protecting the nature, and one of its employees, created a criminal network to illegally cut trees for personal profit. They allegedly bribed the police officer to cover up the crime. Two of them are arrested, one is told to stay in the country. BHK Mikael Melkumyan, who was (is?) the chairman of gas price investigation committee, is now the chairman of the new EAEU (Eurasia Economic Union) affairs committee. He called for an alternative gas delivery system in Armenia, so all the eggs won't be in one basket (GazProm-Armenia), "especially after the recent gas price hike" . He reminded that Iran can also be an alternative source for gas. The government has agreed to remove Value Added Tax (VAT) on electric car imports until 2022 in order to encourage cleaner environment. President Sarkissian is continuing the visit to United Arab Emirates. He met Sheikh Kassim, who agreed to send a team representing factory and business owners to Armenia, to discuss various joint projects. They want to make investments in the energy projects in Armenia. Sheikh has accepted the invitation to visit Armenia. There are talks about declaring two AM and UAE cities as sister cities. President has visited Dubai international financial center and met with the leadership. EU will provide €700 million to Armenia in the following years. Around half of it will be used on building North-South road project, bridges etc. Manvel Grigoryan's lawyers and the angry protesters are no longer "enemies". Today, they met and shook hands. Few days earlier, the lawyer's car was egged. Protesters initially claimed it was after the lawyer used a derogatory language against them. Police was involted. European Court of Human Rights (ECHR) rules that Samvel Hayrapetyan, a businessman at a center of a bribery investigation, who was told to remain in the country, has the right to leave the country temporarily to receive a medical care in Germany, because his rare disease is not possible to treat in Armenia. Aluminum giant ArmenAl and its 700 employees breath a sigh of relief after US Senate fails to block President Trump's decision to lift sanctions against its Russian parent company. Parent company was owned by a Putin allied oligarch Deripaska. US placed sanctions against him earlier. Deripaska then decided to give away control and shares of the company. This meant the company was no longer managed by him, thus sanctions were lifted by Trump. The Democrat Party, joined by 11 Republicans, decided to keep the sanctions, but fell short of 3 votes in Senate. Notable Democrat voting against preserving the sanctions was Bernie Sanders. ANCA did not lobby during the debates. Armenian government has finalized the papers and gave a green light to Ministry of Nature & Resources to authorize the construction phase of $250 million thermal power plant, a joint project between Italian RENKO, German Siemens and Armenian government. Thousands of temporary and over 200 permanent jobs will be created with high salaries. Seventy dozen employees will be sent to Germany for training. 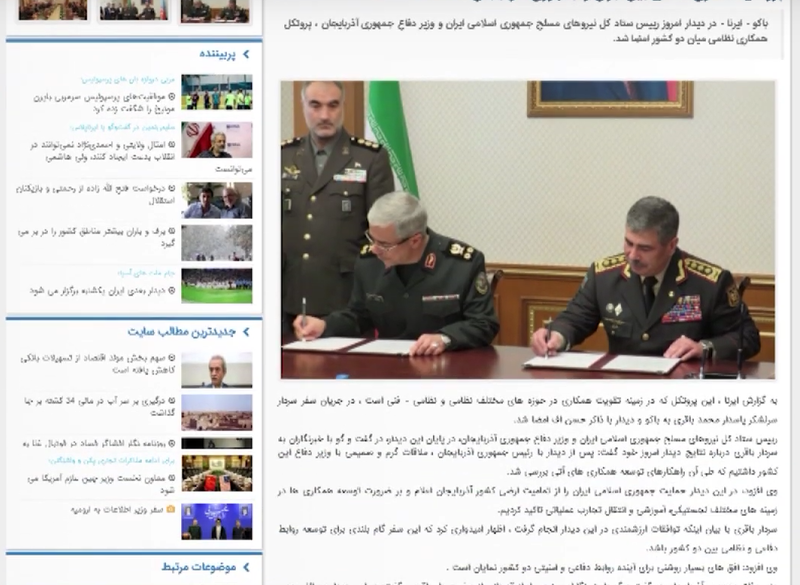 An Iranian general recently visited Azerbaijan, where he repeated Iran's stance on the Artsakh issue, saying that Iran supports the "neighbor's territorial integrity" and wishes the Artsakh conflict to be resolved peacefully according to international law. This is in line with Iran's previous statements, and it's used by most other nations too. Certain news outlets presented his comments inaccurately, presenting it as "Iran recognizes Artsakh as part of Azerbaijan", suggesting a significant change in Iran's stance in favor of Azerbaijan. Iranian official Mahdi V. has clarified that the Iranian general's words were deliberately distorted. IrNa Iranian media outlet's only Russian-language section cited an Azeri media outlet's misleading report, which then spread to other news outlets. Other sections did not mentioned about Iran recognizing Artsakh as part of Azerbaijan. The term "territorial integrity" is a generic term used by many countries, including US, EU, Russia, and it can mean various things, but it is not specifically about Artsakh becoming part of Azerbaijan. European Parliament has passed a resolution condemning the human rights abuses in Azerbaijan. Two dozen European MPs complained about the treatment of blogger Mehman Husseinov, who was arrested on what is believed to be bogus charges. MPs also criticized their own colleagues who lobbied on behalf of Azeri government after being paid to close the eye on human rights abuses, and for trying to exaggerate Azerbaijan's role as a direct and reliable source of energy for Europe. They called for the corrupt MPs to be held accountable too, as in the case of Pedro Argamut.